Check this out: The Pop Ups have an app! Play along with Miss Elephant’s Gerald! The Pop Ups have an app! Just in time for Halloween, their song, “Miss Elephant’s Gerald” has been turned into a Mibblet! Keep reading for how you can enter to win a free download. From the creators of Mibblio (an interactive kids’ music app), Mibblets are illustrated songs that sit within Mibblio’s interactive musical framework. Each Mibblet features a host of instruments (keyboard, “strum pad,” percussion) that encourages kids to channel their inner maestro and jam along with the band. “Miss Elephant’s Gerald” is the perfect song to play along with because it starts off with a steady beat and works its way into an explosion of sound, teaching kids about timing and rhythm while also fostering a deeper understanding of musical composition. When Em and I played along, we found that the ukulele and vibrasnap added some nice accompaniment. Albeit, the vibrasnap does get addictive, but it works really well with the song; Both are irresistably catchy and kooky! When we were done jamming, we were able to enjoy “Miss Elephant’s Gerald” a cappella (users can choose to turn off the music by deselecting instruments), allowing us to use the Mibblet as an audio book. By reading along, I gained a deeper appreciation for just how brilliantly creative and hilarious this song is! Brooklyn artist, Liz Starin, does an excellent job of bringing the tale to life through whimsical illustrations. Now, I realize we are in the digital age, but I would love to see this song, along with Starin’s drawings, translated into print. 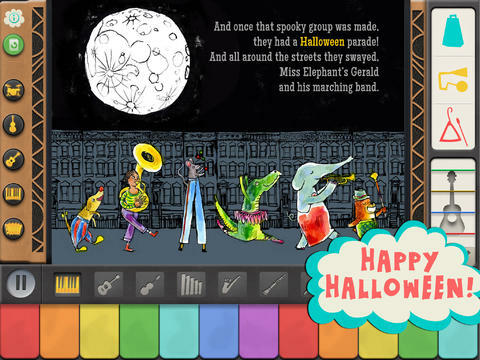 Targeting ages 3-8, the “Miss Elephant’s Gerald” app is a is a kid-friendly Halloween treat that is perfectly safe for consumption! 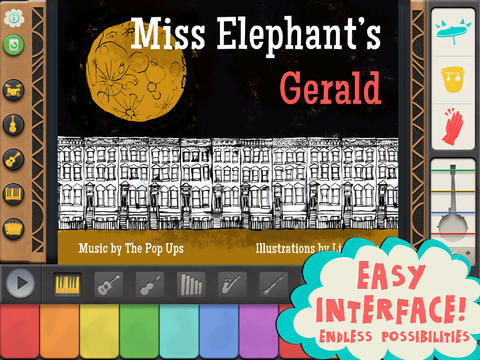 ENTER TO WIN A FREE DOWNLOAD: Thanks to The Pop Ups, 3 lucky Kids Can Groove readers will get a chance to download the “Miss Elephant’s Gerald” app for FREE! – Leave a comment on this post sharing if you are familiar with Mibblets, and if so, which other ones you enjoy. – Like the Kids Can Groove Facebook page. The giveaway is open through midnight November 1, 2013. Winners will be announced on Monday November 3, 2013. Note: Mibblits are currently only available for the iPad. Mibblio is a creative studio that makes interactive music apps designed for kids. 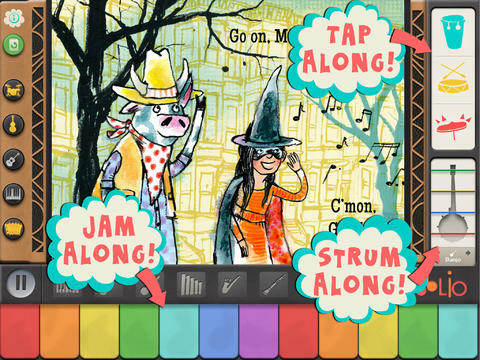 Our inaugural and acclaimed app, Mibblio®, combines stories and music to form beautiful MIBBLETS — illustrated songs with loads of musical features that enable kids to read along, sing along, and jam along. « View This: “Where Do Monsters Go When It’s Not Halloween” – Ratboy Jr.